It’s deep in the middle of the season, and it’s a grind. You have to ensure you’re filling the pipeline, retaining employees, not burning them out, getting bids out on time and keeping clients happy. You’re juggling many issues and problems—the irony is that the more you focus solely on solving your short-term pain, the more likely your short-term pain will repeat itself. To move past short-term pain and create an abundant future, you need to employ a bifocal growth strategy. The lower lens of your bifocal focuses on the short-term goals and obstacles, making sure this year’s budget and goals come to fruition. The upper lens looks into the future and plans for growth above and beyond this business year. 1. Current budget is today. This area is where your lower lens focuses to ensure you retain clients and meet your sales goals. 2. Next year’s budget is where your key account managers and salespeople are building relationships with current clients to understand tomorrow’s needs and how you can fulfill them. 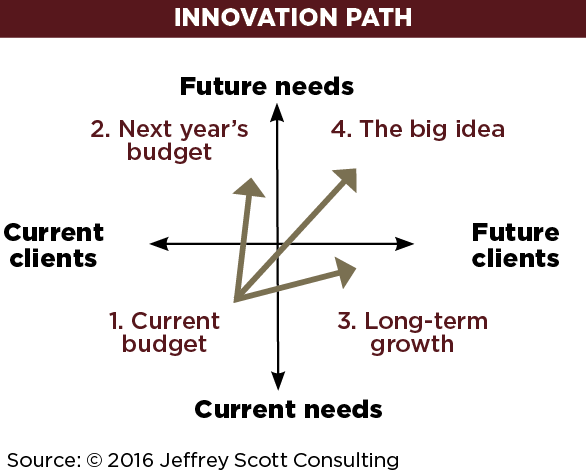 This quadrant is also where new product ideas are born and ideas are formed for future revenue. 3. Long-term growth is where the leader (or business developer) needs to spend time to develop new relationships with potential clients to help them meet their current and upcoming needs. This area helps fill the pipeline and maintain future growth. 4. The big idea is one of the leader’s most important jobs. This is where new opportunities for growth are uncovered that will stretch your company beyond its status quo and plant the seeds of growth for years to come. Operating in this quadrant requires an open and creative mind to lead these conversations and to understand what the future brings. Your company should dedicate someone to each quadrant. Some companies only operate in quadrant one or two. The key is to move into all quadrants—growing your company’s skills from bottom left to top right. To do so, the leader must delegate relationships with current clients to spend time with possible future clients. The owner can stay in touch with some important current clients, but at a higher level. For example, the owner stays in touch with the owner or top leader of the client’s organization while company managers are serving the property/project managers from the client’s organization. If you hire and train well, you won’t be pulled down into fire fighting, and you can spend your time in the future-oriented quadrants. Here’s an example: I’m working with a $5 million company that’s growing steadily and has greatly improved profitability, and yet leadership is overly focused on today (quadrant one). The company is doing well at the expense of its future. The challenge to the owner is to uproot himself from his comfort zone, change his focus and delegate more of the day-to-day to his capable leadership team. Doing so will allow him to create and ensure long-term success. Breakthrough idea: A measure of success for the leader is widening the top of the sales funnel with new, high-profit opportunities. In which quadrant do you spend most of your time? Do you need to shift? Have you successfully widened the top of your funnel with new high-profit opportunities? If it’s not you as owner widening the funnel with new opportunities, then who in your company is doing it?